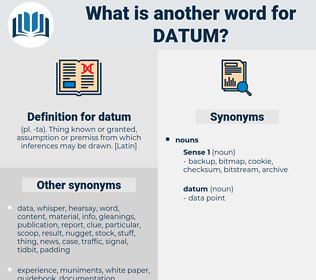 What is another word for datum? inactivity, fabrication, abstract, death, lie, inertia, inanimate, failure, ignorance, ruin, destruction, concept. error, myth, misconception, falsehood, inaccuracy, misstatement, fallacy. Not only these but a multitude of other deductions follow rigorously from the simple datum that every particle of matter attracts every other particle with a force directly proportional to the mass of each and to the inverse square of their mutual distance. 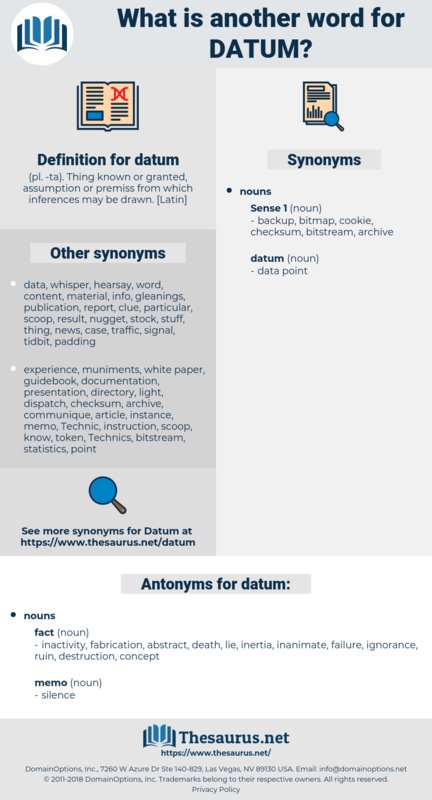 demon, deny, dittany, dahomey, domain, deweyan, dominee, danau, dm, daemon, diam, demean, detainee, dean, dine in, dama, donnean, dane, didion, dome, diwan, denim, dune, Dahna, dominie, diatom, den, dna, dun, deem, dodoma, dawn, duodenum, doyen, dietitian, donne, dynamo, dine, donee, domain name, don, down, Dodonaea, dam, danaea, dyne, dead-on, dominion, diamine, die down, dudeen, damn, dana, damon, Duomo, downy, danu, dime, domine, dame, daytime, do in, dayan, deaden, dummy, domino, downy haw, detain, demo, Dona, diadem, diodon, din, dioon, dayton, dionaea, donna, doyenne, dim, done, donnian, doom, diana, duenna, daimon.